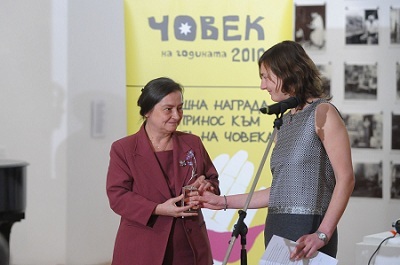 The Supreme Bar Council Chairwoman attorney Daniela Dokovska was awarded the Human of the Year Award 2010 at the annual ceremony held by the Bulgarian Helsinki Committee to celebrate contribution to the protection of human rights in Bulgaria. ‘Attorney Daniela Dokovska is a leader of the Bulgarian legal profession and is respected both as the most influential lawyer in the country and as Chairwoman of the Supreme Bar Council. She has always fought for ethical laws, for an honest justice system, for an orderly state, and for a fair judicial procedure. She always stood for justice – justice that belongs to the people by law, in the face of opposition from society and the authorities. This year she relentlessly worked against all attempts to create legislation that would have harmed the integrity of our justice system and would have restricted the human rights in trial. This year she also came to the defense of the most vulnerable members of our society – the children with mental disabilities living in institutions. She responded promptly to the campaign led by the Bulgarian Helsinki Committee and spoke in the children’s defense before the Prosecution Service demanding that any evidence of misconduct in respect of the children must be investigated thoroughly – including the cases of deaths in the past. As a result, the Prosecution Service promised to do all that is expected of them,’ said the Chairwoman of the Awarding Committee, Margarita Ilieva of the Bulgarian Helsinki Committee. In addition to the Human of the Year Award, two second place awards and one special award were presented. Attorney Valeria Ilareva and the organization Elektronna Granitsa won, respectively, second and third places. Attorney Valeria Ilareva is defending the rights of refugees and immigrants in Bulgaria. She is the most nominated person for the Human of the Year Award 2010 – her nomination was proposed 20 times. Valeria is a human rights lawyer who works pro bono. Her work is intended to benefit the other, and not her own identity or her own community. Valeria has been very successful in fighting for transfers of foreign nationals from the notorious detention center in Busmantsy. Hers is the main contribution to the campaign for amendment of the Foreign Nationals Act in its regulation of the status of foreigners who do not possess valid documents, of their rights to education and to employment in Bulgaria. Elektronna Granitsa (Electronic border) is an organization for the protection of free information and of privacy within the electronic communications sector. The project includes more than 300 activists fighting against ‘the uncontrolled intrusion of the authorities into our private space’, and for the protection of freedom of expression. Peter Kichashky received recognition as Activist of 2010. He is a 21-year-old law student in a wheel-chair who already has a number of successful battles under his belt – he has won cases and led initiatives for the protection of people with disabilities. He has filed dozens of inaccessible architecture complaints before the Commission for the Protection against Discrimination against banks, public services providers, etc. In November 2010 he won his case against the Troyan Monastery Hegumen – the first discrimination case in Bulgaria against a member of the clergy. The winner of the Audience Award was the person who received the most votes posted at the website humanoftheyear.org – Ivo Indjev, a journalist. He was nominated by four people who gave the following reasons for choosing him: ‘Ivo Indjev is a brave man because writing about the unsightly side of Bulgaria takes a lot of courage these days. It is even more courageous to stand alone, surrounded by a crowd of bend backs.’ and ‘Because the Bulgarian media do not perform their duty as the fourth power in our society, people like Ivo Indjev, who are not afraid of expressing their own opinion and who act as true journalists in compliance with the principles of deontology, these people are rare and they must be supported.’ Ivo Indjev received 1486 votes. The winners in the 2010 awards (from left): Ilia Markov and Konstantin Pavlov from Electronic Frontier (third award), Daniela Dokovska (first prize), Valeria Ilareva (second prize), Peter Kichashky (2010 Activist of the Year special prize) and Ivo Indzhev (audience award). Two special recognition prizes were announced at the ceremony. The Awarding Committee acknowledged the contribution to the advancement of law made in three strategic judicial decisions issued by the judges Snejana Denkova, Angelina Boneva and Georgi Elchinov. These judicial decisions were the result of successful collaboration in the protection of rights between all the participants in the proceedings. In recognition of the contribution to the progress of the LGBT movement the Awarding Committee praised the work of activists fighting for the rights of the gay, lesbian, bisexual and transsexual community in Bulgaria. The Human of the Year panel of judges, from left – Yana Buhrer Tavanier, Margarita Ilieva, Desislava Petrova (from the BHC), Theodora Zaharieva (Human of the Year 2009), Mimi Furnadzhieva (Human of the Year 2008). The Human of the Year Awards are not financial prizes – their purpose is recognition and encouragement, their aim is to facilitate the human rights debate and activism in Bulgaria. The winner of the big prize was presented with a crystal statuette and a certificate, and the rest of the winners received plaquettes and certificates. Each year the Bulgarian Helsinki Committee welcomes nominations in favour of persons or organizations based on general criteria. This year the Awarding Committee approved 26 nominations. The organizers invite nominations in support of contributions made to the filed of human rights that are precedential, original or creative. This year’s online votes for the Audience Award exceeded 5500 in total. 47 000 visited the web-site of the Human of the Year 2010. In 2009 their number was 15 000. This project has been made possible by the generous financial support of the Oak Foundation, the Open Society Institute – Budapest and the Netherlands Embassy in Sofia.